Karen Ellyard - Bio. Spiritual Healer. 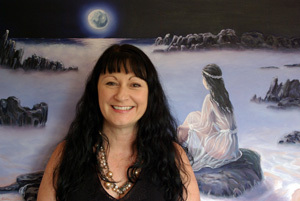 Psychic Medium, Clairvoyant, Reiki. Gold Coast, Australia. From as early as I can remember, I had visions that other people obviously did not see. As this was very unusual and never explained to me as a child, I must admit to finding it terrifying and spent most of my childhood afraid of the dark (silly really when a lot of my visitations happened during the day). For many years I tried to pretend that I was just like everyone else. This was often difficult as the spirit world does not go away just because you think you want it to. Spirits have always been drawn to my energy as they know that I can see and hear them and give them the assistance they require in communicating their messages. As I grew older, life taught me the lessons I needed to bring me to a place where I had grown enough to accept who I am. I began to experience the huge difference this gift makes in the lives of people who I have shared the visions and messages with. I have embraced this gift, at times more enthusiastic than others, and went on a journey of learning to enhance this talent. For many years I have worked with helping people connect to loved ones, help with advice from their guides and assist them in making life changing decisions. I was very close to my grandmother growing up for the short time she was living with us as she also was gifted and it gave me someone to talk to now and again. Since she has passed, she visits me on a regular basis, watching over me and helping me in all sorts of ways. I am very happily married, have two children and three grandchildren whom I am all quite besotted with. I have a very keen sense of humour (sometimes wicked), love to paint as I am also an artist. I have a great sense of fun and enjoy life immensely.